Home » Blog » What Am I Supposed to Do Now?! Let’s face it. Sometimes you can do everything right, and it still feels like you end up getting a raw deal. You want to scream your frustrations at the world. You might even cry yourself to sleep at night, so worried about your family and your future that you can’t imagine moving forward. So what are you supposed to do now? One of the best ways to snap yourself out of an angry, disappointed, despairing state of mind is to simply formulate a plan. It doesn’t have to be a comprehensive, this-one-idea-will-solve-everything plan, it just has to be a step forward – it just has to be the next step. Meet Steve. Steve did everything right. A three-sport athlete in high school, he went on to college, earned good grades and secured a great job with a Fortune 500 company before he even graduated. Five years in to his new job, Steve had already earned a couple of promotions, and his co-workers fixed him up with Marla, a wonderful woman who was on a fast-track career path at the same company. As it turned out, they were a great match, so they got married, bought a nice house, had three kids and continued to rise through the ranks at work, all the while following the traditional advice about saving 10-15% of their income and building up a nice retirement savings account. Steve and Marla just celebrated their thirtieth wedding anniversary. Their youngest son finishes college next year, and they’re looking forward to spending time with each other again when they retire, six or seven years from now. They’ve done everything right, from beginning to end, but they just found out that due to some organizational changes at their company, they both have the option to take a buyout before the end of the year or they’re going to get laid off by the end of the next calendar quarter. Sadly, in today’s world, this scenario is more common than one might think. In these difficult times, after the emotion has subsided, it may be time to consider options. Is accepting an early retirement really an option, or does their current financial position in relation to their age mean that they will need to continue working? These are answers that are very difficult to make without a detailed financial analysis and stress tested computer projections. Many clients in Steve and Marla’s situation have the same fears and concerns. The sort of “forced retirement” situation that they’re in makes them re-examine their retirement plans, and in many cases adds extra years that their savings will now have to cover. Many times, they’ve never gone without a regular paycheck, and now they need to figure out how to take their retirement savings, social security and other assets and convert those into a reliable source of income for their family. Krista McBeath, a Bloomington/Normal Financial Planner who specializes in retirement planning for corporate employees, advises those in such circumstances to look at the entire financial picture before making retirement decisions. Her company, McBeath Financial Group, has recently seen an influx of clients in similar situations when a local insurance company downsized and offered early retirement settlements. She noted that approximately half of the individuals had the luxury of accepting an early retirement offer. Krista doesn’t recommend retirement without planning, calculating and projecting for a variety of scenarios. When a calculated stress test provides a very high success rate for maintaining quality of life without running out of money in a client’s lifetime, she is comfortable recommending their retirement. Here's the process she utilizes when working with clients in order to ensure success and give peace of mind. At the first (complimentary) appointment, Krista will meet with Steve and Marla, discuss their current financial situation and ask about their goals and priorities. If Krista feels she is a good fit for Steve and Marla’s goals, and if Steve and Marla agree, then Krista will begin the financial planning process. She will construct a detailed plan for managing the buyout and the best ways to maximize the options for future income and distribution of funds. Then, if Steve and Marla wish, they can collaborate on a plan to manage their wealth with Krista. At McBeath Financial Group, the only goal is to provide detailed and efficient plans for helping clients achieve their financial goals. Their proprietary Technology Empowered Advisor Method (TEAM) is a unique retirement planning process that integrates the personalized touch of a relationship-based advisor with high tech software tools to assess the client’s current portfolio and then analyze options from a variety of financial vehicles. Computer stress tested solutions generate detailed reporting that Krista uses to educate clients on future financial projections or problems. 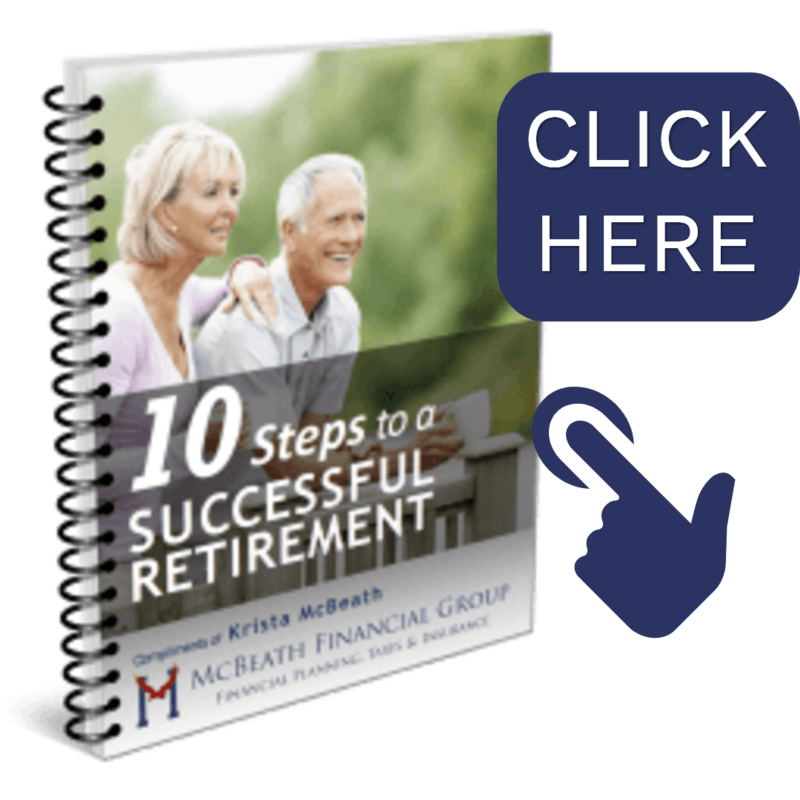 The in-depth calculations for success, along with their guidance, gives their clients the confidence to enjoy the stress-free retirement they have earned. As an additional edge, McBeath Financial Group is also an experienced tax preparation firm. That’s important to ensure that client’s investments, assets, and social security are at an advantage for income and wealth transfer strategies. That along with the application of complex calculating software and experience with corporate forced retirement offers provides an edge for their clients. Sadly, you probably know someone that is in a situation similar to Steve and Marla’s. They need to know that help is available. They can contact Krista for an appointment today and take the next step toward lifelong financial peace of mind, to enjoy the stress-free retirement that they’ve worked so hard to earn!